For this week’s Interesting Artist article, I was able to sit down with Amy of Oddcessories on Etsy.com. 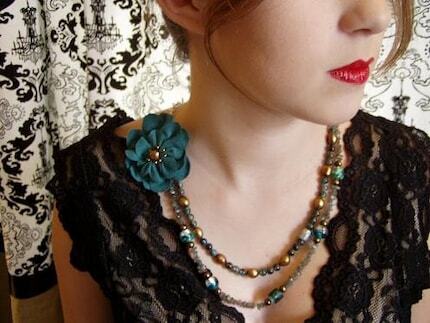 Amy creates a wonderful line of fabric art jewelry that seems to hearken back to the 1920s in design style. Good morning Amy! How’s your studio going this morning? It’s going great! I am doing some historical costume research (inpiration for new pieces) and working on some sketches for a lot of new accessories. It was actually sort of accidental. I really love jewelry and have a Bachelors degree in Fashion Design & Manufacturing, so I made a necklace for my sister incorporating fibers & fabric as a gift. She wore it to her university classes, and the next thing I know I am getting requests for jewelry from her friends. 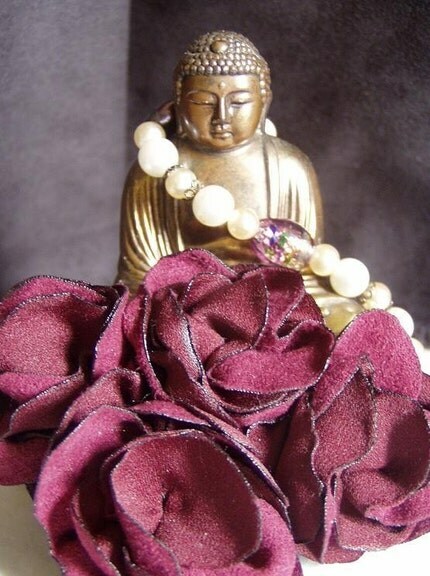 I look at fabrics and fibers from a jewelry perspective. Where some fabrics are too “showy” or fancy to wear for day, they sometimes make fabulous, wearable, elements for jewelry. My daughter was seriously ill & hospitalized for 2 weeks in critical care a couple of years ago. After that event, I started thinking about how life is so precious & special, but fleeting. You never know how much time you have, so if there’s something you want to say or do or accomplish, there is no time like the present! My personal favorite is my Poppies necklace. I love poppies (always reminds me of the move Wizard of Oz), and I love the vintage beads that were used in this necklace. 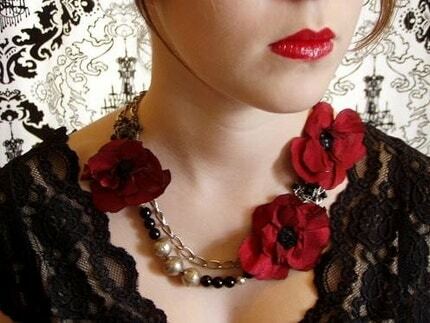 Your fabric art jewelry is so amazing, what made you decide to incorporate fabric art pieces into jewelry? As a seamstress, I always have smallish bits of beautiful or expensive fabric around. Bits & pieces of fabrics that are too small to make an entire garment, but too gorgeous not to wear, so incorporating them into jewelry was the best way to get to wear fabric that I otherwise couldn’t use. I know we all make mistakes in this field, but can you tell us how you fixed one of your worst? A couple of years ago I made a specially requested necklace for someone, and the person caught a jump ring on her sweater & the necklace exploded with beads flying everywhere. I took all of the components & restrung everything, and this time I soldered the jumprings. I sent it back to her with a little gift (customer happiness is my #1 priority!). I now solder all the jumprings I use so that there will never be a replay of that incident. Thanks so much Amy for taking time to visit with me today. It was my pleasure, Kaelin. 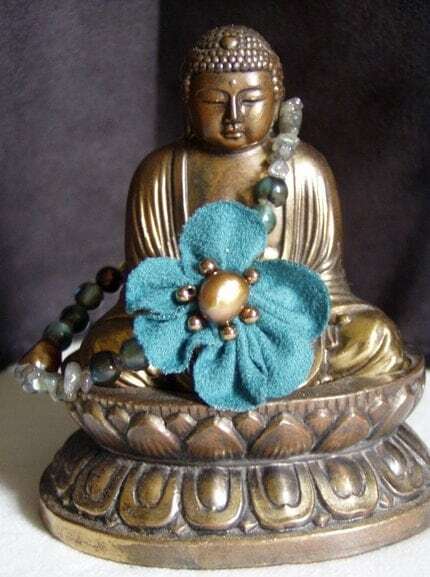 If you’d like to see more of Amy’s wonderful vintage style fabric art jewelry, please visit her shop on etsy.